Take these handy packets to work, school, or any place that you need to prepare a quick, hearty vegan meal in a hurry! 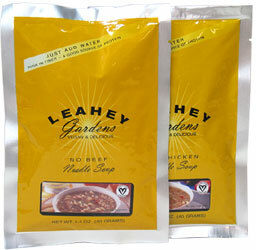 Leahy Gardens’ vegan soup packets are single-serving sized meals-in-minutes that contain a rich, savory broth, full of ribbon pasta or rice and accented with vegetables and delectable spices. With added protein and fiber for a more nutritious meal, you’re getting something you can feel good about eating on the go. For stovetop cooking you'll be ready in as little as 5 minutes, and for the microwave, just a minute or two is all you'll need to prepare these tasty soups. Available in Chicken and Beef flavors. 1.4 oz. packets are $2.49 each. From Anonymous of Salisbury, Maryland on 10/4/2017 . I LOVED chicken noodle soup as a child and have been looking for a vegan alternative for the last few years. Unfortunately this No-Chicken Soup doesn't taste anything like the classic, as it tastes mostly of sweet red pepper. Not bad for what the soup is but definitely not a "chicken noodle" substitute. From Susan Bair of Mentor, Ohio on 7/23/2010 . Mmmmmmmmmmmmm - the Chicken is very very yummy! From Emily Stern of Ann Arbor, Michigan on 6/1/2009 . needs some salt and pepper, but generally good and filling for the calorie count. From erikabg of Boston, Massachusetts on 2/27/2009 . Tasted kind of like plastic. Had both chicken and beef versions. From Christina sanders of Demotte, Indiana on 10/4/2008 . good when sick or in a real soup mood.